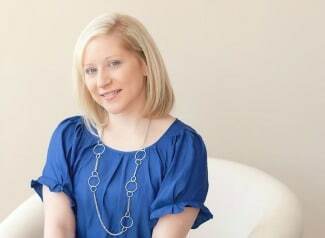 A Golf Themed Party isn’t just for old men who like to hang out on the course all day. Heck, no! This little guy is ready to Par-Tay at his big golf shindig! When you are dealing with a little golf fanatic who is easily calmed at play school by whipping out a set of golf clubs, you know that you’re going to have one fun-filled event on your hands! The Killarney Country Club served as the perfect backdrop for this unforgettable gold themed 3rd birthday party. We love the combination of the astroturf backdrop, along with the burlap bunting hanging above the dessert table backdrop. 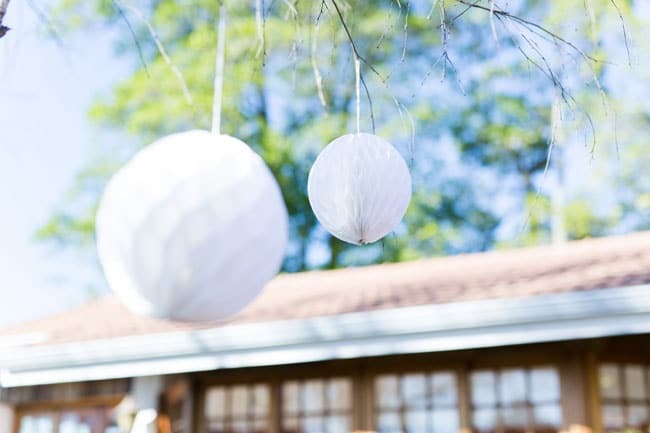 And how cute are the white honeycomb tissue paper balls that are the perfect replication of a golf ball hanging around the party?! Great job, mom! Since the birthday boy shows no signs of slowing down with his passion for the game anytime soon, Mom, who also happens to own In These Stilettos, knew it was going to be perfect. A Golf birthday was planned, set up and a complete natural fit! 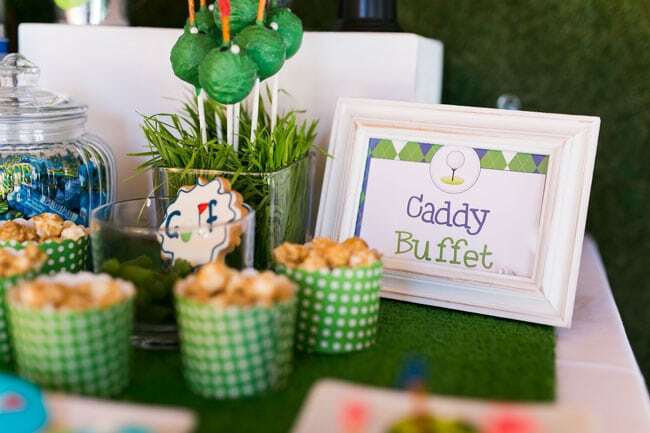 Golf Themed Food was quite easy to plan with the creativity of this Mom! 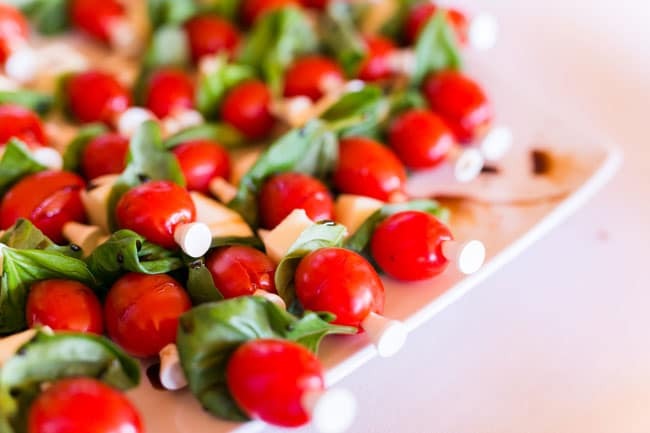 Mini Caprese Salads were prepared on a golf tee! Really? We just love this idea! What a great way to incorporate the golf theme into every little detail! 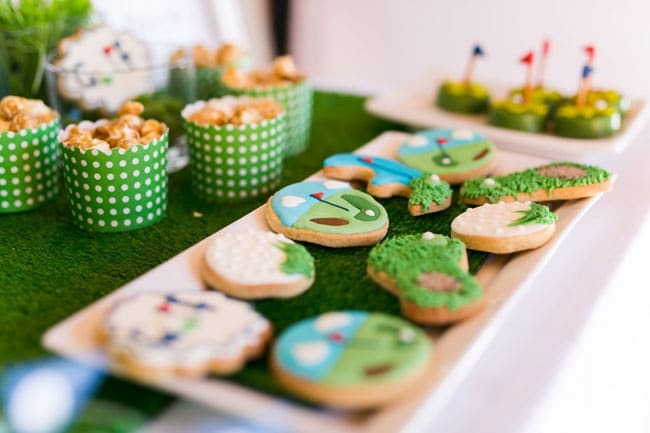 We adore these perfect golf themed cookies, provided by Sprinkles Bakery! They went all out and created the perfect backdrop from golf hole-shaped cookies, golf ball cookies, and a sweet golf tee setting cookie. All of the guests couldn’t wait to gobble them up! We also love the caramel corn served in individual green and white polka dot cups. What a great way to have everyone take as much as they want without getting all of those little hands into a large serving bowl! Mini golf course cake pops were a big hit with all of the guests! Who doesn’t love cake pops?! Don’t worry, there weren’t many leftovers from the candy table, thanks to Mom leaving empty sweet bags for everyone to fill at the party! 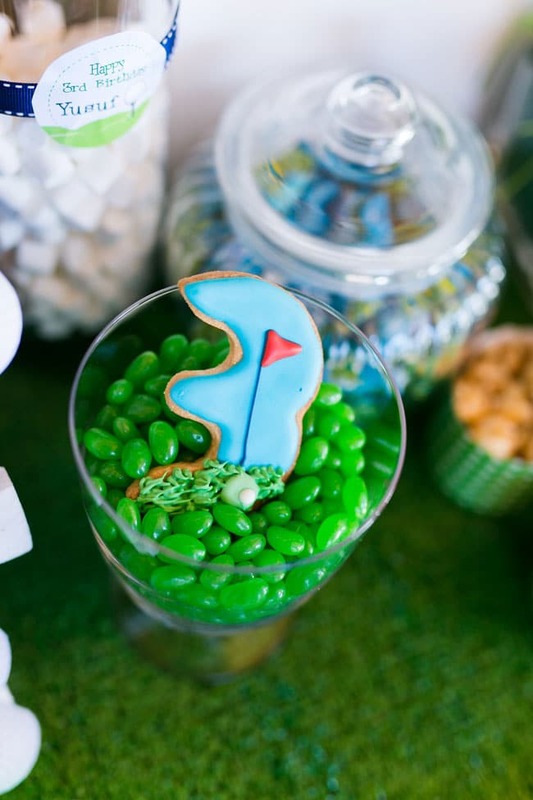 How cute is this golf themed dessert, perfectly settled into some “grass”, or what we would like to call green jellybeans?! The candy table included every kind of candy imaginable for the little party guests. Everyone couldn’t wait to dig in. Mom really thought of everything for this Golf Themed Birthday and went above and beyond what any 3-year-old birthday boy could have ever hoped for! 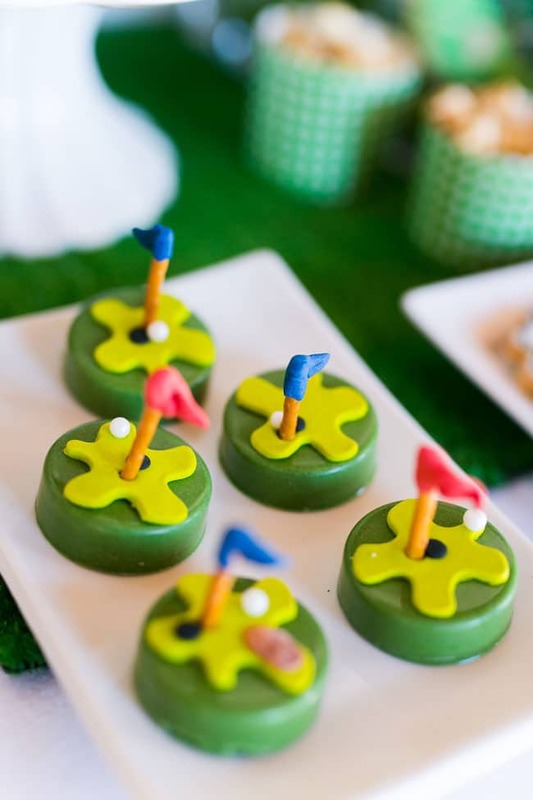 Golf themed chocolate covered Oreos were provided by Sugar Paper Parties and they were everything you would dream they would be! 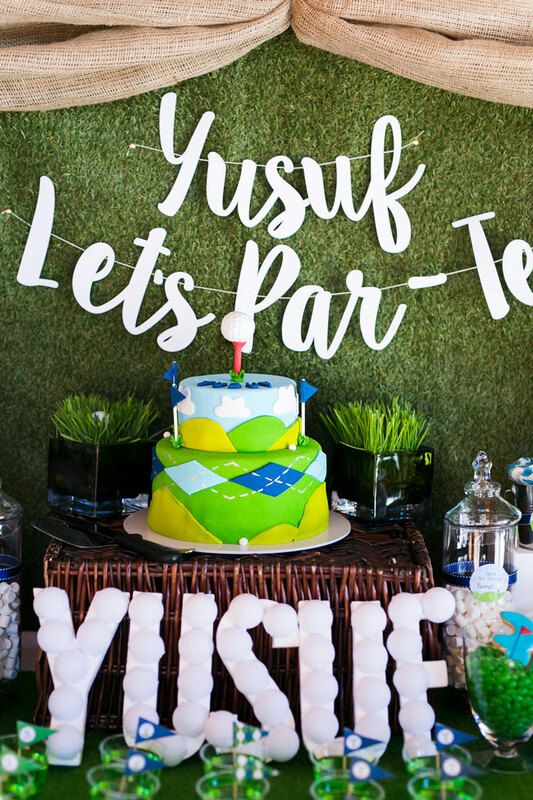 Delicious, adorable, and the perfect fit for this golf themed party! And hello… there are OREOS in there! Every 3-year-old’s favorite cookie in the world! Who could turn down this cute “Caddy” Buffet?! Luckily, everyone got to dig in and not just the caddies. 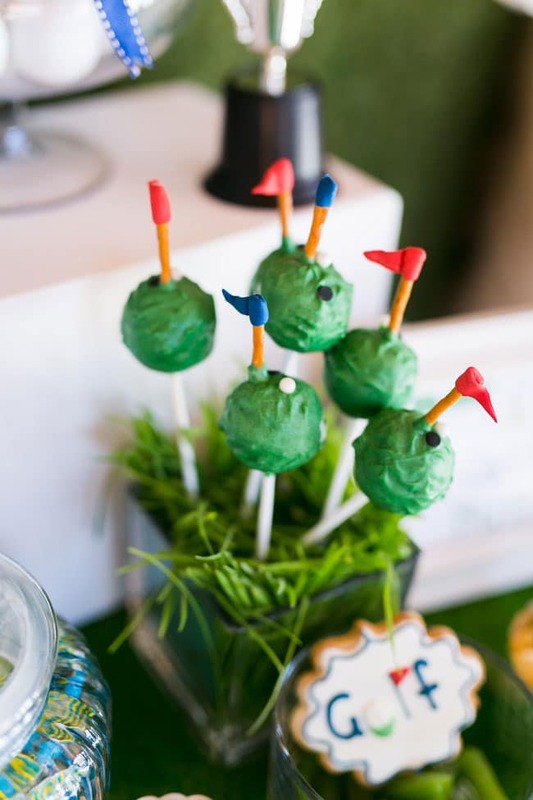 We absolutely love the idea of having grass in some of the serving items, like how it is accentuated with the cake pops. So cute! Little was forgotten or unthought of when it came to golf party desserts. The candy table was a big hit, along with all of the other yummy additions that were added to the dessert table. Fruit PAR-faits rounded out the incredible Golf Themed Food that was served at the party. Jello is a hit with kids of all ages, but smaller children?! We know just how much they love to dig in and enjoy a jello feast. And the golf ball tags that were added into each cup are a perfect addition. 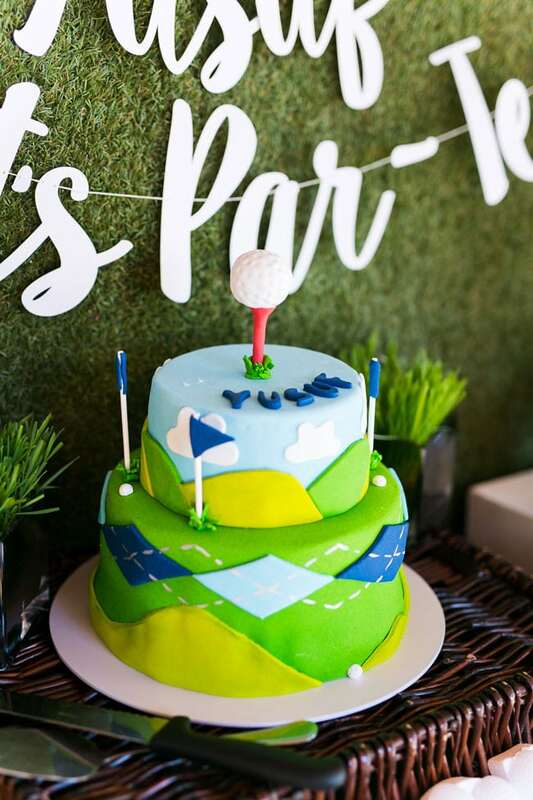 Sugar Paper Parties created this breathtaking Golf Themed Birthday Cake! Just check out the amazing detail on this cake. Not only that, but it just oozes fun. The bright colors, the fun flags that surround the cake and the perfect golf ball cake topper create the perfect golf themed party cake. We absolutely love it! It’s makes a great dessert table centerpiece. Of course the water bottles are decked out with perfect water bottle wrappers! 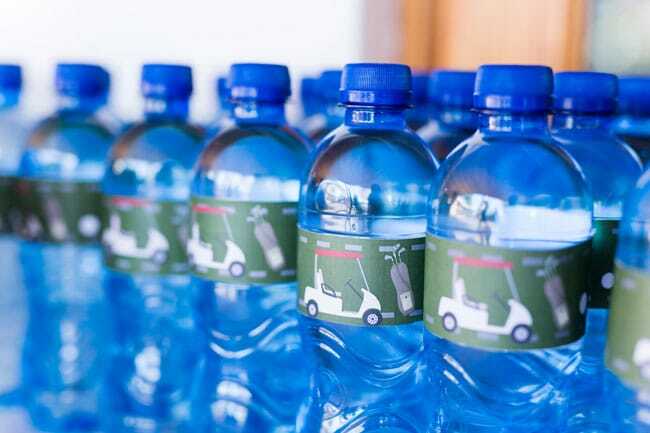 The wrappers featured fun golf carts and golf clubs. Nobody had to worry about hydration after working up a sweat with some fun Golf Party Games! Guests has a blast playing mini golf outside until their hearts were content. How perfect! Studio Hooray created the perfect personalized birthday banner that was front and center at the candy station! Another perfect pairing for this golf themed party was the astroturf backdrop that was featured. 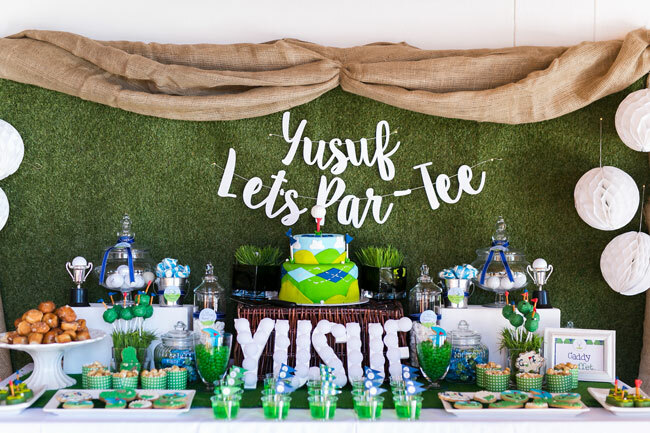 Even the birthday boy’s name was covered in little golf balls to make it stand out and make it extra special. 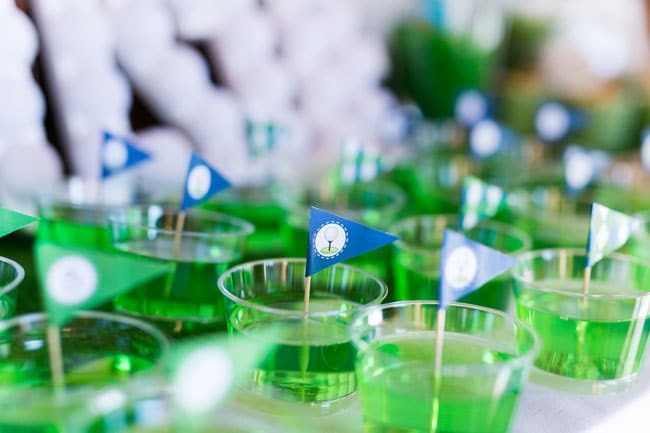 All of the Golf Party Decorations were absolutely perfect and no detail was missed. 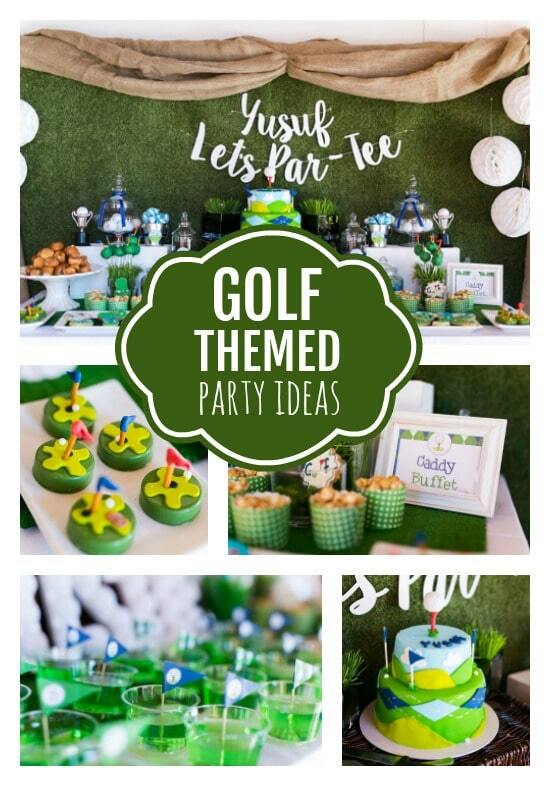 We certainly can’t wait to throw our own golf themed party now, no matter the age! Even better? Mom didn’t send home Golf Favor Bags that were only full of sweets. Plastic golf clubs and golf balls were given out to each of the little party guests to take home and hone in on their own golf game! We’re pretty sure this little guy is going to start loving golf even more after this great golf themed birthday party! He may have even more golf clubs and golf balls to play with after this awesome Golf Themed 3rd Birthday Party.